This page covers the author of The Godwulf Manuscript. For other authors named Robert B. Parker, see the disambiguation page. Robert B. Parker has 1 media appearance. Be inspired by this physician turned author! Gerard LaSalle is an MD, CMO, award-winning filmmaker, visionary and respected leader, teacher, and story-teller. As a graduate of Reed College, Cornell University Medical School and California Institute of the Arts, LaSalle has not only left an imprint on the medical community, but has been honoured for his animation and teaching films, documentary, and writing. LaSalle’s love of history and his native area of the Pacific Northwest were brought together beautifully for the making of his first novel, Widow Walk. Isthmus, is the sequel. For more information, please come to the information desk or call 604-598-7406. Join the History of Mystery Class when we meet to take a look at those authors, issues and novels that have shaped the course of crime fiction over the years. This time, we'll be discussing Early autumn by Robert B. Parker. 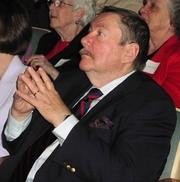 Robert B. Parker , A Catskill Eagle. Robert B. Parker reads from Resolution. "Probably your last chance to see Robert B. Parker! He no longer tours, but he has come out of touring retirement for his new western novel, Resolution. Don't miss this event! Robert B. Parker on tour for Resolution. Robert B(rown) Parker (1) was born September 17, 1932, in Springfield, MA. He earned a B.A. in English from Colby College in Maine in 1954, served as infantryman in Korea, and earned an M.A. in English from Boston University in 1957. He held several jobs before enrolling in Boston University's PhD program, and then taught English at various colleges until 1978. He is married to the former Joan Hall; they have two sons. Parker has created private detectives Spenser, and Sunny Randall, and Police Chief Jesse Stone, each of whom is featured in an ongoing series. Their story lines occasionally intersect. He also writes an American Western series featuring Hitch and Cole, and has contributed to the Wyatt Earp saga with the novel Gunman's Rhapsody. Recently, he has written some young adult fiction as well. He died unexpectedly at home in Cambridge, MA, on January 18, 2010. "Robert B. Parker" is composed of at least 2 distinct authors, divided by their works. You can edit the division. Robert B. Parker is composed of 12 names. You can examine and separate out names.